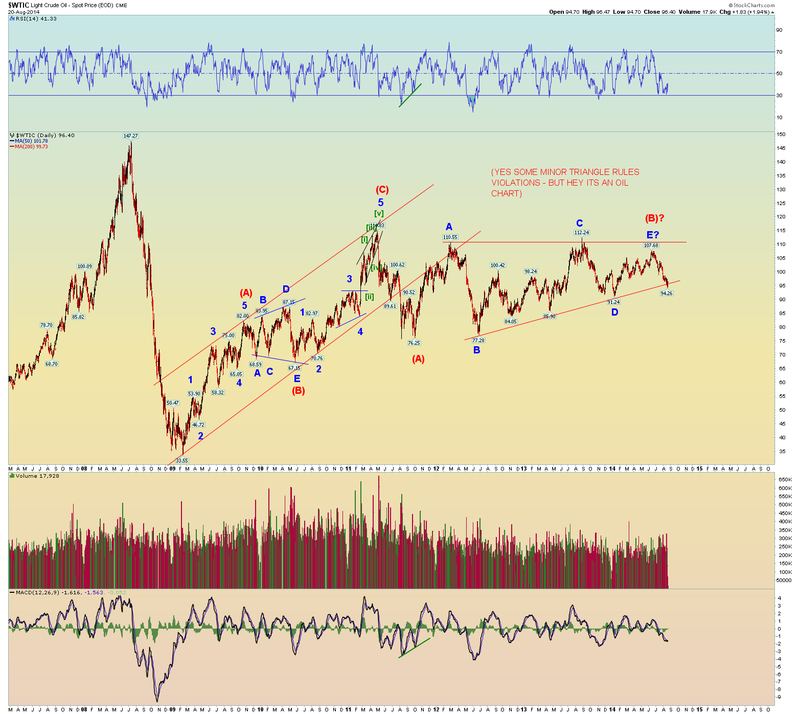 Big Elliott Wave International FREE Club membership push this weekend! < < < Just click my links to the left. I get a $3 commission for every Club EWI member that signs up via clicking my links. It really is FREE, with no strings attached. You get access to a LOT of free articles and information. Then if you ever decide to subscribe to one of their financial service newsletters, books, etc. I get a small commission for that also. I subscribe to EW Financial Forecast (monthly), EW Theorist (monthly), The Socionomist (monthly), and Short Term Update (M-W-F). I recommend them all. Based on Fibonacci wave relationships the "top" of cycle wave b projects to 2014 - 2034 SPX. The primary count now has us in wave iv of (v) of [v] of 5. 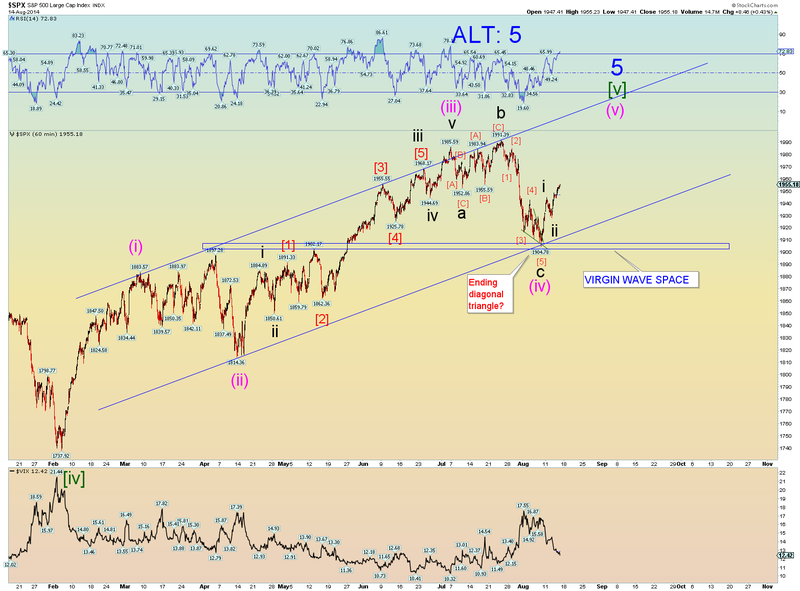 Wave iv would look better if it pulled back a little more to perhaps close the recent gap up that exists at the previous subwave  price range. 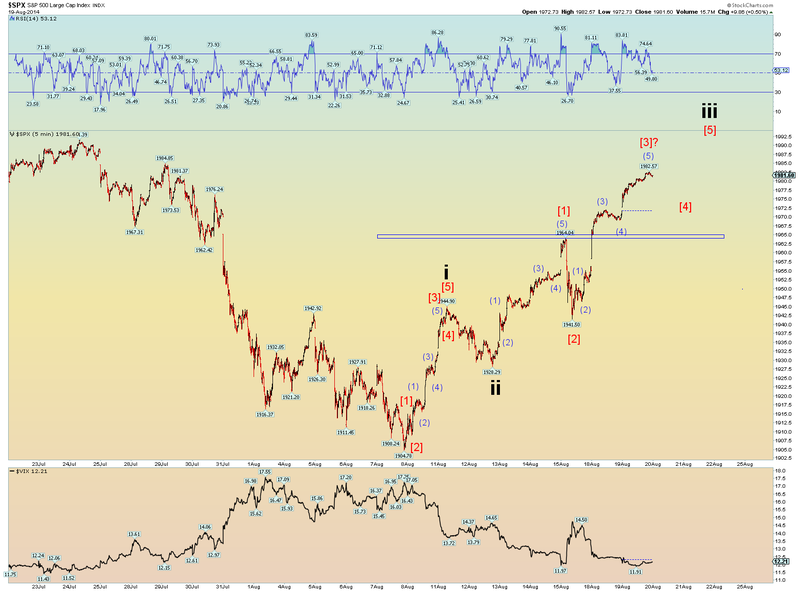 The SPX hourly shows where upper support is. The nearest support is in the 1983-1985 range. 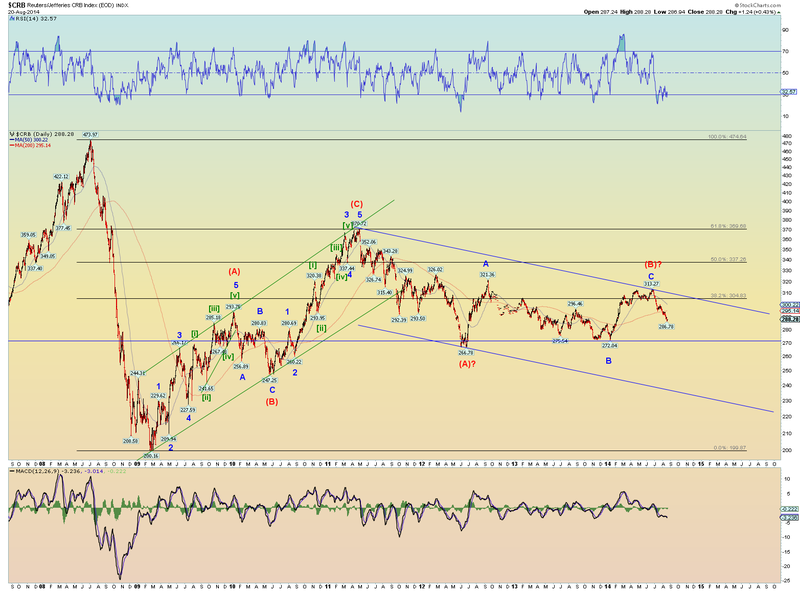 A wave iv low in that price area would make a really nice wave structure. 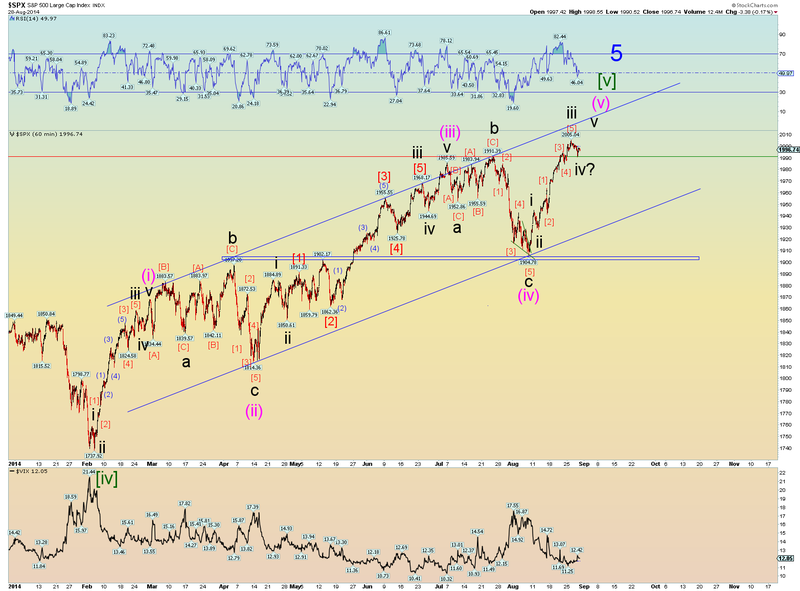 Then wave v would push above the previous high and finish cycle wave b from the 2009 low. The squiggle count looks pretty good for wave structure and form. A good symmetry exists. 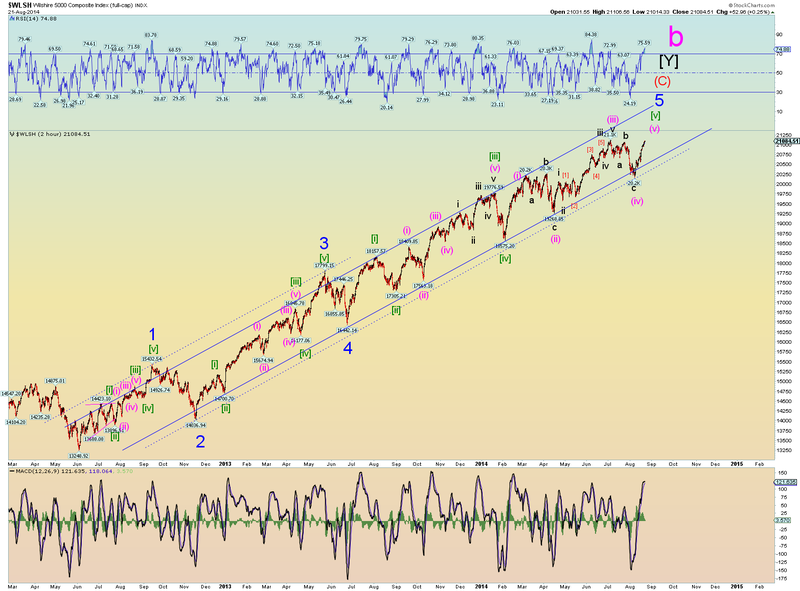 Top of wave iii? 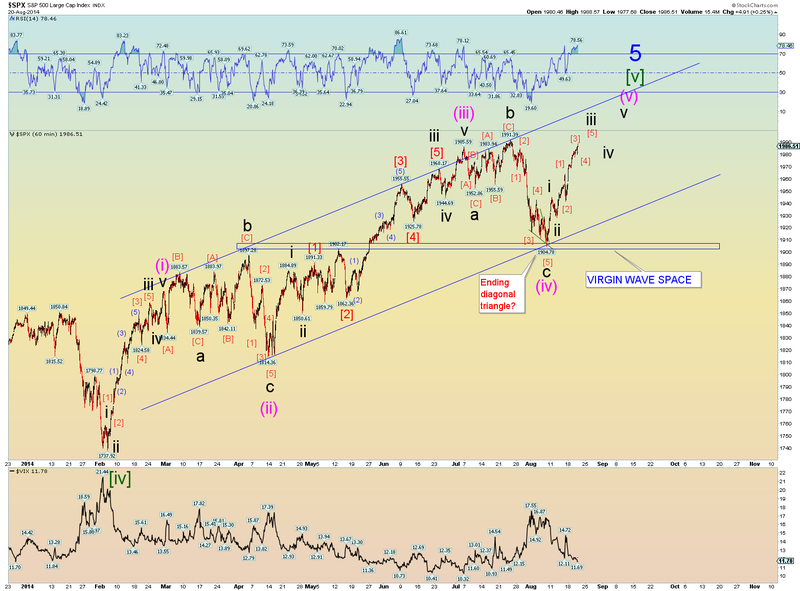 Wave iv would probably fill the last two open up gaps of the past few days. 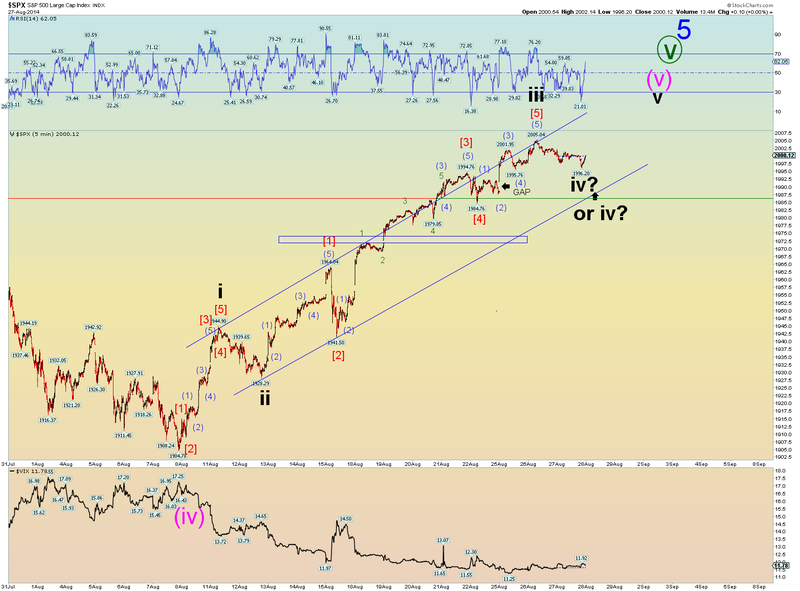 Top of wave iii of (v) of [v] of 5 today? Breadth Thrust indicator never actually crossed the .615 threshold yet. 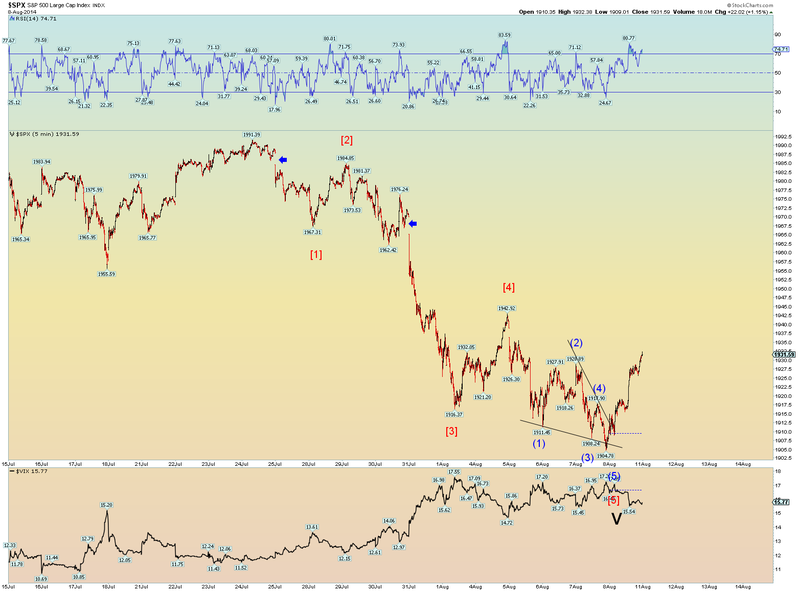 And now there is a bit of negative divergence. Still trying to confirm if the peak of wave iii of (v) of [v] has occurred yet. I imagine if Monday is another day of weakness, then we can say probably yes. 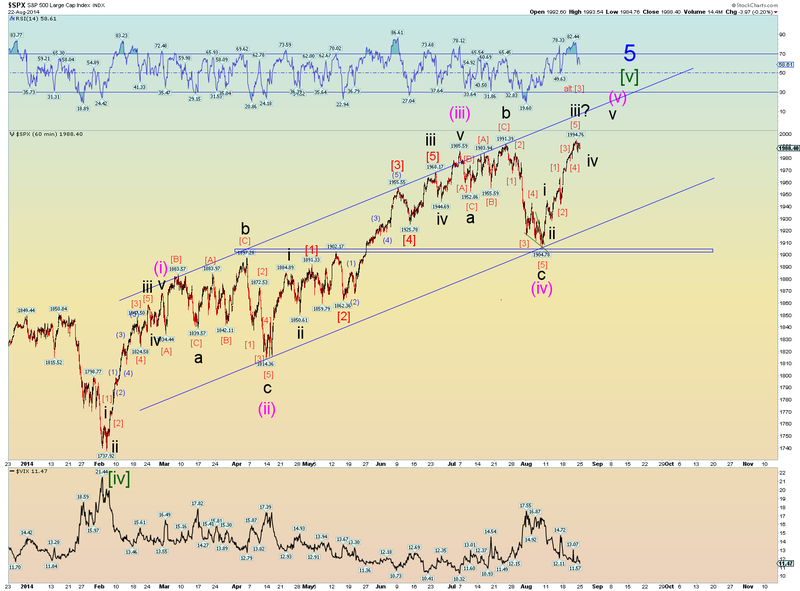 But if Monday pops to a new SPX high right out of the gate, then perhaps the final squiggles of wave iii are still playing out. 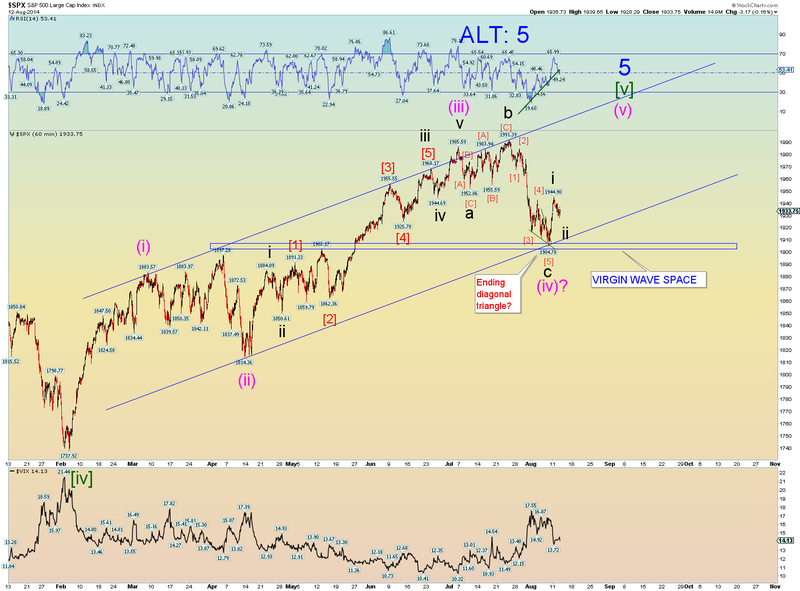 Best count is the market is seeking the top of wave iii of (v) of [v] of 5. We got a new high today in the SPX and the Wilshire5000 (same count as the SPX) was a mere 2 points shy of a new intraday high. Squiggle count shows a possible subwave count for wave iii of (v) as it has extended a very nice Fibonacci 1.618 the length of wave i. Regardless once more of the structure unfolds, we should be able to identify a projected wave iv pullback. And then after wave iv is identified, the final squiggle wave v of (v) of [v] of 5 of (C) of [Y] of cycle b can counted toward its very end. Labor Day-ish? Big chart update tonight. 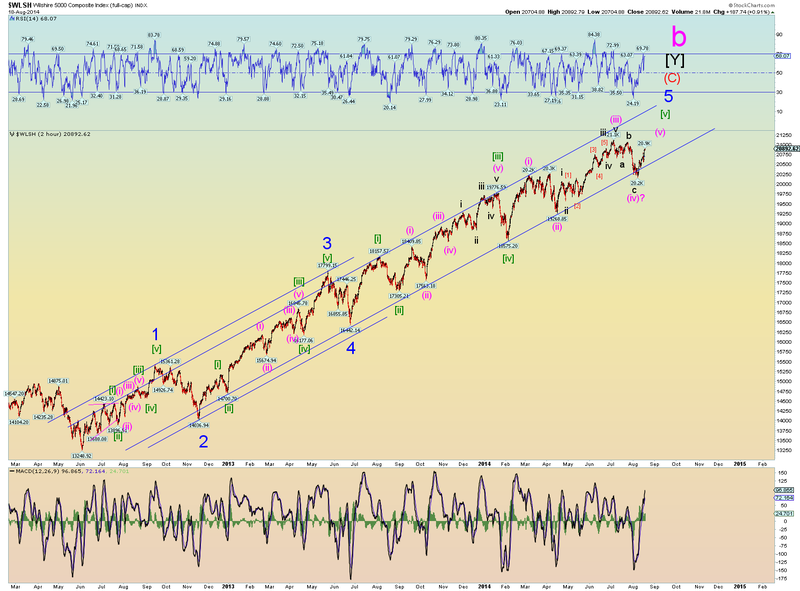 Its getting fun to count waves as our primary count has been working very well now for many months. But all counts must come to (a proposed) end and this one is nearing the final stages. 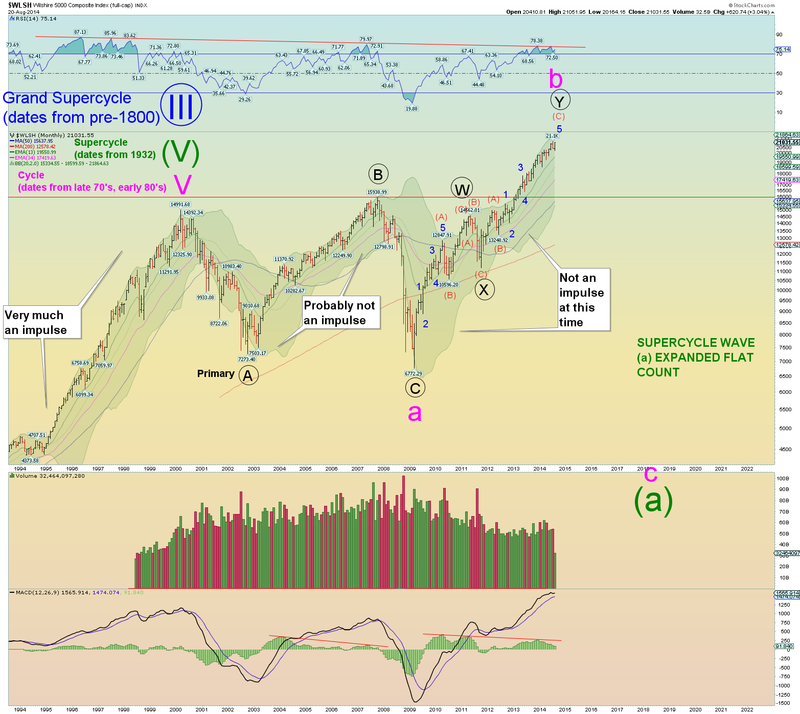 The overall long term count is that we are in a cycle wave b of an expanded flat of Supercycle wave (a) of Grand Supercycle wave [IV]. 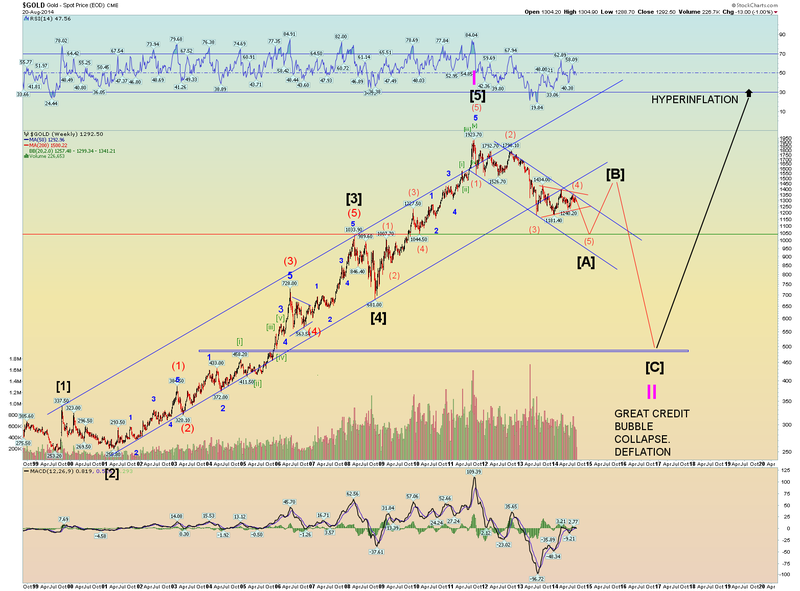 To get an idea of how long Grand Supercycle wave [IV} is expected to last, the first wave (a) has so far taken 14+ years and is expected to take 16 or more overall once cycle wave c unfolds. 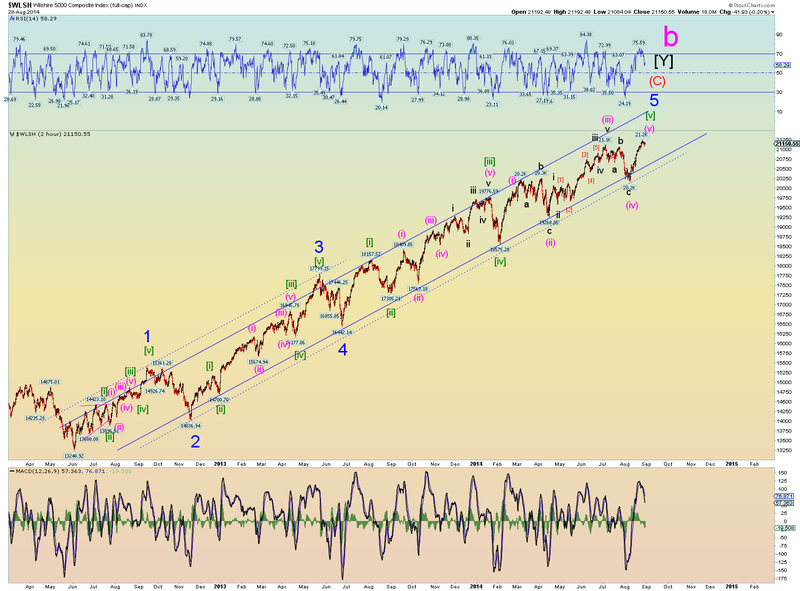 Multiply 16 x 3 waves and you have a 50 year or more sideways correction. And it could be double that if the waves trace a complex "double three" or some such stuff. 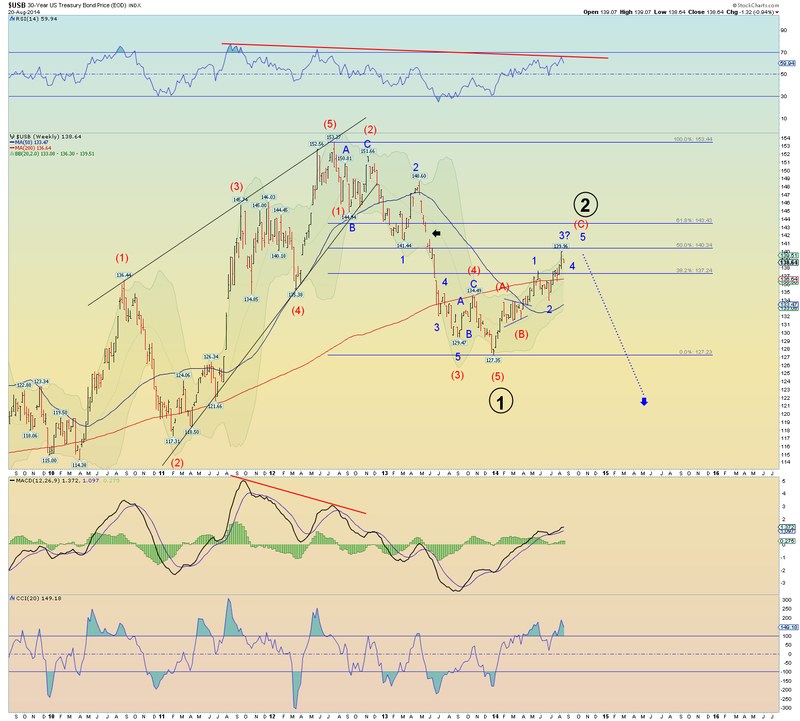 I won't be around to know so we only need focus on Super-cycle wave (a) for now. Cycle wave c should take prices way lower than the 2009 low. That is how an expanded flat count works. The wave b goes higher than anything before and c will exaggerate way below wave a. 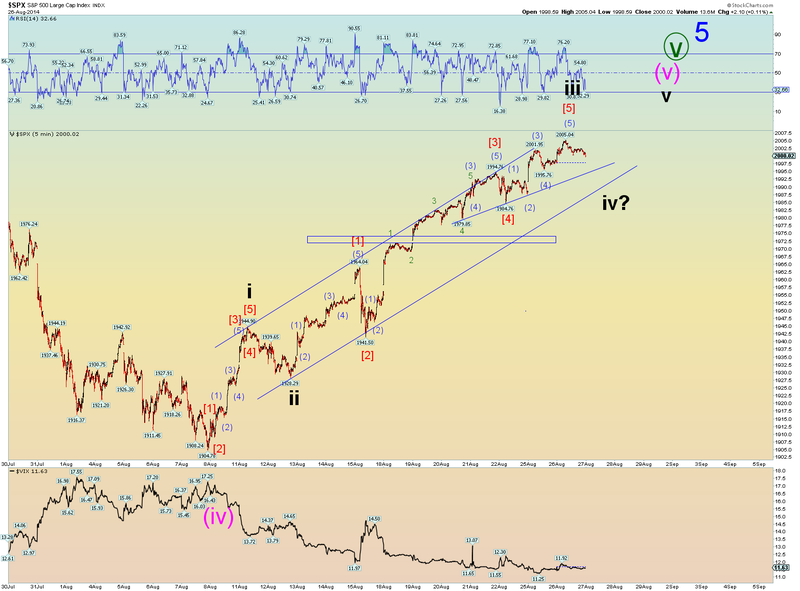 Why is not the above wave considered an impulse from the 2009 low? 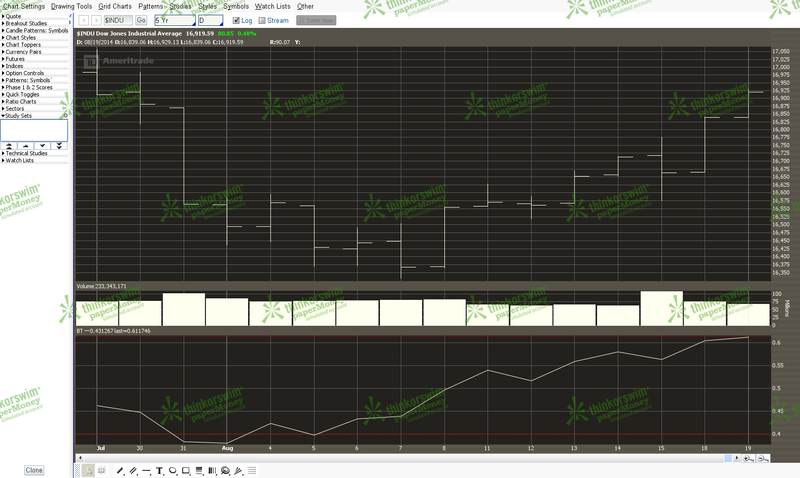 Well it only exhibits a three wave pattern and 3 wave patterns are corrective in nature. I explain in this post why its 3 waves for now. What will it take for it become an impulse? Well, it needs a corrective fourth wave of some size and then a fifth wave from the 2009 low. In that case, wave [W] would be labeled wave  - or wave (1) if you prefer a lower overall degree - and wave [X] would be labeled wave . 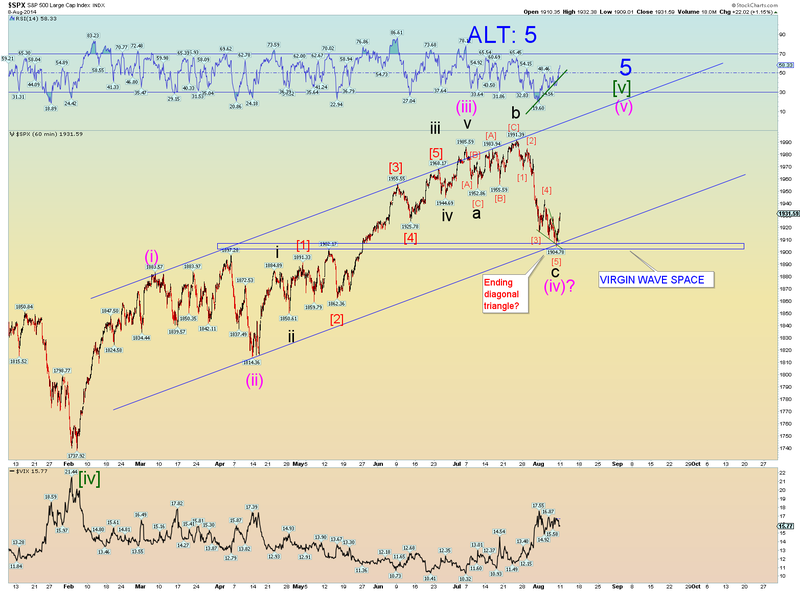 The projected near term high coming would be labeled wave . We would then need  and  to occur. And they would project to take another 1-2 years at the least. Certainly we cannot rule it out. But its not the preferred count. One strong clue that this is a corrective b cycle wave is that we seem to be experiencing an extended minor 5 in the final position. An extended wave 5 does not make EW sense embedded in a wave . 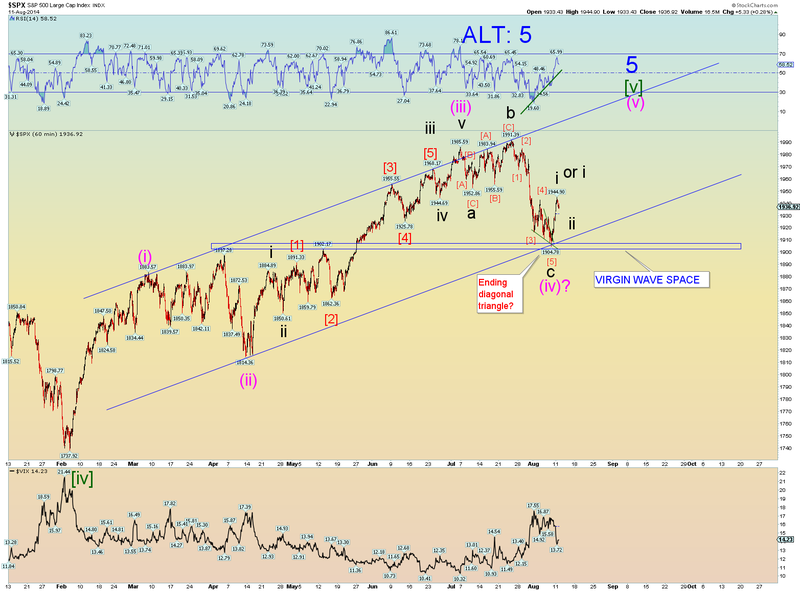 Could happen, but an extended wave 5 is a sign of exhaustion in the market, which does not make sense to be part of a wave  which should be the strongest part of an impulse pattern. Wave threes do not exhaust, but final position waves do exhaust. Do you follow? 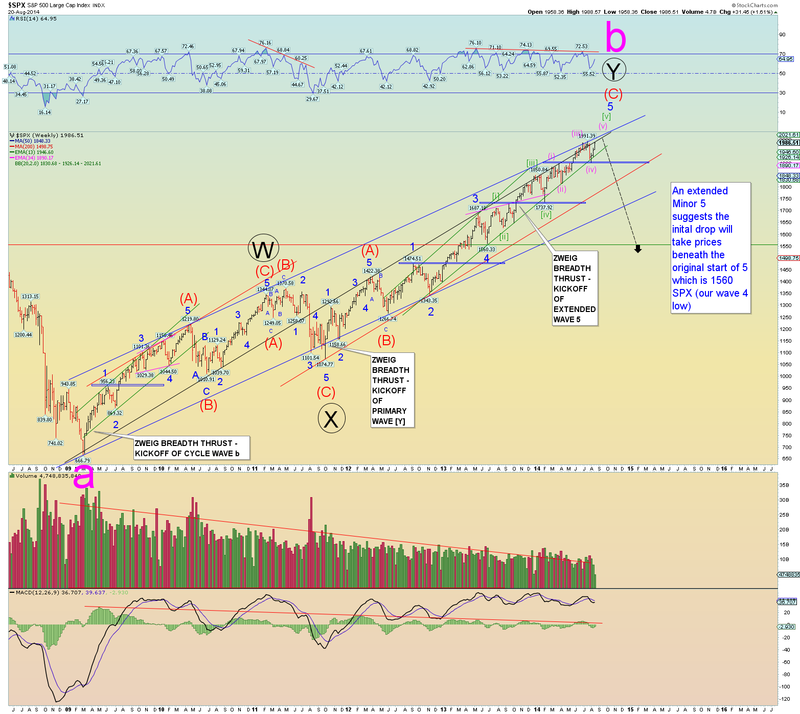 The SPX weekly chart breaks the cycle b count down in more detail. You can see the final extended Minor 5. The general rule of an extended wave five of any size is that's its a sign of exhaustion. Or rather, that the market gets stretched and exhausts as a result. In social mood terms we have refused to "let go" and we managed to keep the party going. And we have. Yet the final outcome is that we'll pay the price regardless and with interest. We can party until 5 in the morning but sooner or later, we need to crash and sleep. That's the analogy. Except in this case we are just going to get really pissed off. Well, kinda of like a hungover drunk. And the next day will be useless. In stock market terms, the next wave after an extended Minor 5 is a literal price crash to at least below where the Minor 5 started (1560 SPX). So our hangover analogy works quite aptly here. The next day after partying until 5 in the morning is usually a complete waste and washout. There is little doubt that wave (C) of [Y] of b exists as a 1 count structure. It fills a neat tight channeling and counts excellent as I have it below. There can be no more extensions of Minor 5. It it does, then my entire count of Primary wave [Y] would likely need a major revamp. But I have no reason to suspect that is going to be the case. We can break the structure down even further. 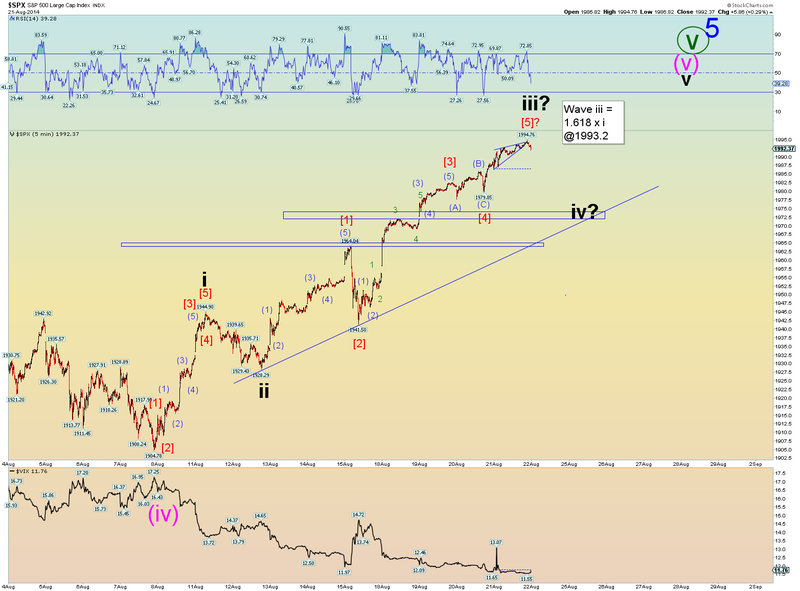 The SPX 1 hour chart shows that wave (v) of [v] of 5 is well underway. It looks right. 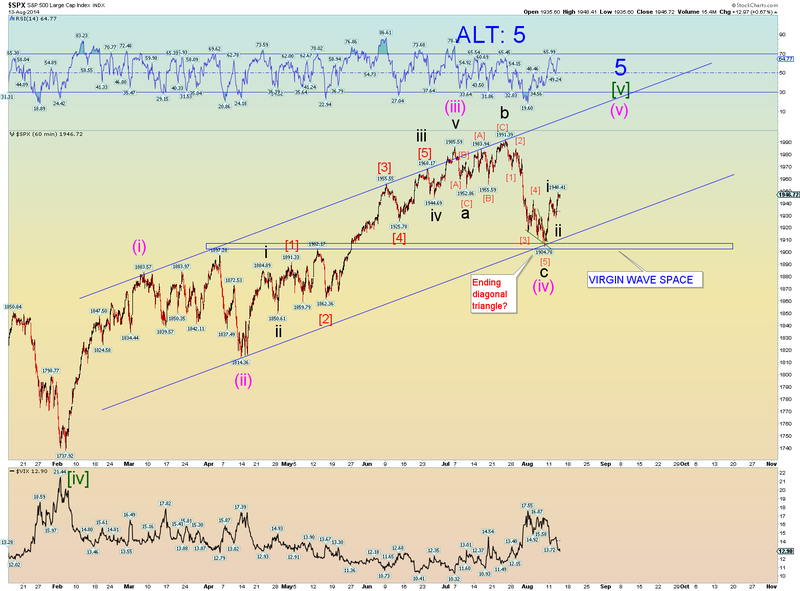 And zooming in further we can see that we are likely past the "third of a third" up for wave iii of (v) of [v] of 5. 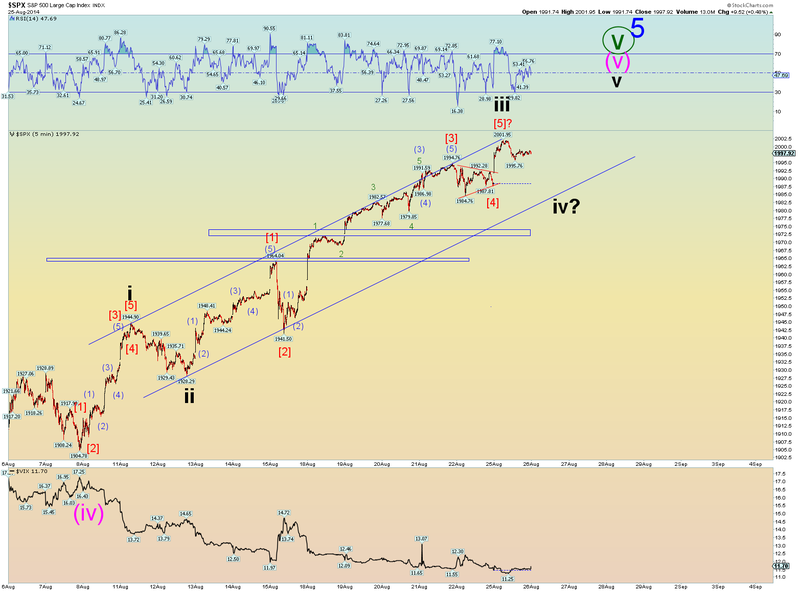 Best squiggle count is that the market is probing for the top of wave iii of (v) of [v] of 5. 1993 SPX is where iii = 1.618 Fib times the price length of wave i. 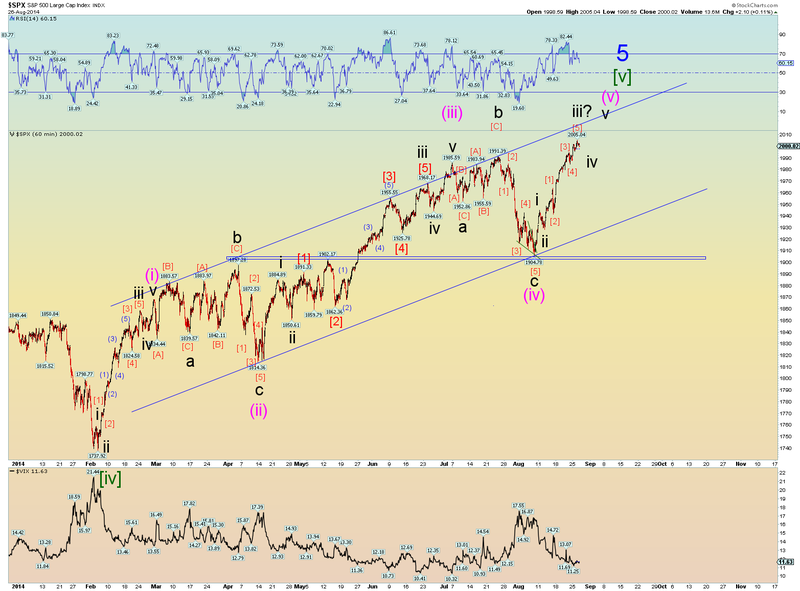 So we might be close to marking the top of wave iii. 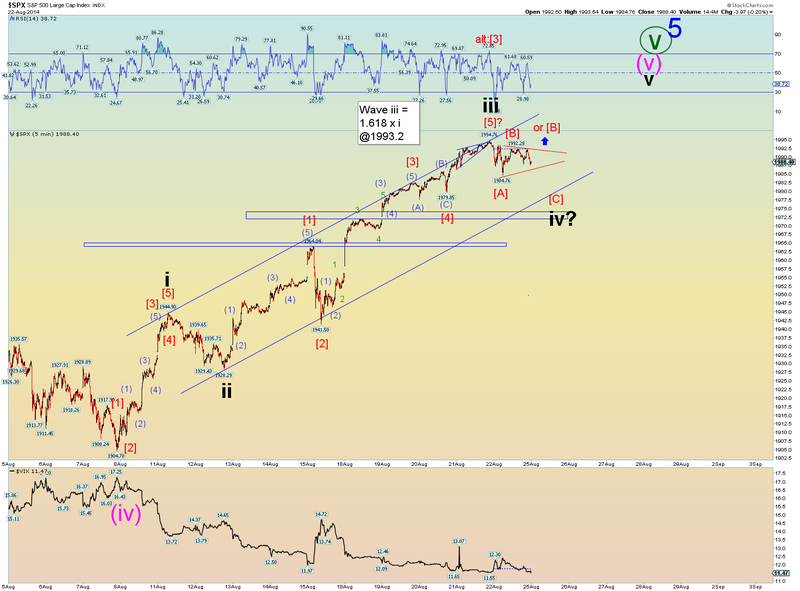 Then wave iv would drop us a bit and if wave v = wave i (40 SPX points) we could start to project the top tick of cycle b by adding 40 points to the wave iv price low. For instance, if wave iv pulls back to 1974 SPX, add 40 would give us a 2014 SPX cycle wave b top. 2014 in 2014. 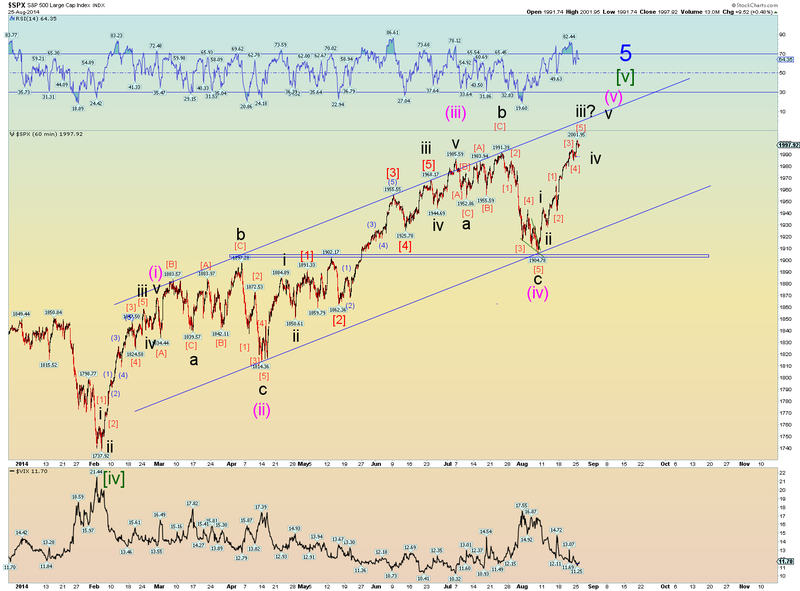 Yes its as ominous as 666 SPX low. Yes I believe hyperinflation can happen. But I strongly believe we must have our massive credit collapse first. And (paper) Gold is a (leveraged) fraud as much as anything in these markets. Bond sentiment is at an extreme. 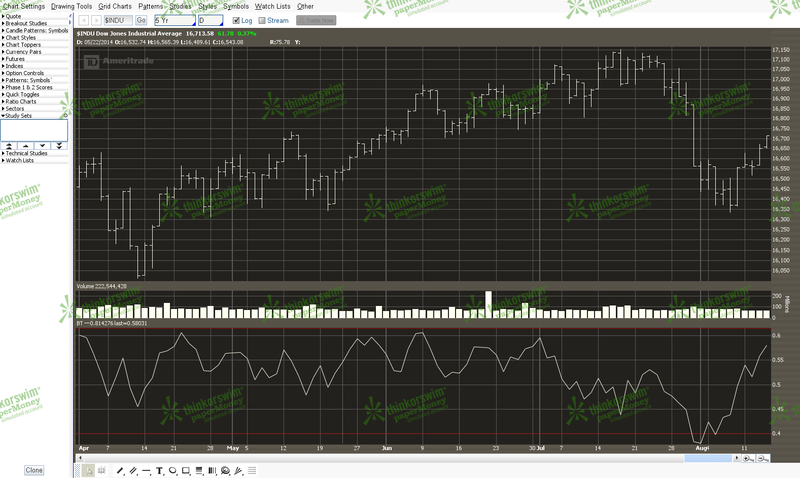 EWI on Monday reported that the Daily Sentiment Indicator (DSI) as posted by Trade-Futures reached an extreme 91%. 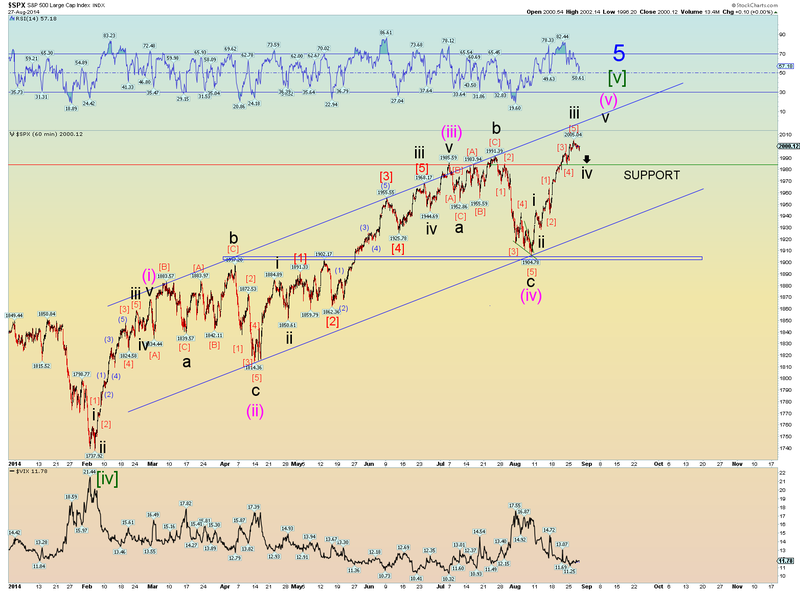 They mauy have some more subwaves to go, but if the SPX sells off hard, at some point bonds will too. The bond charts supports this notion. 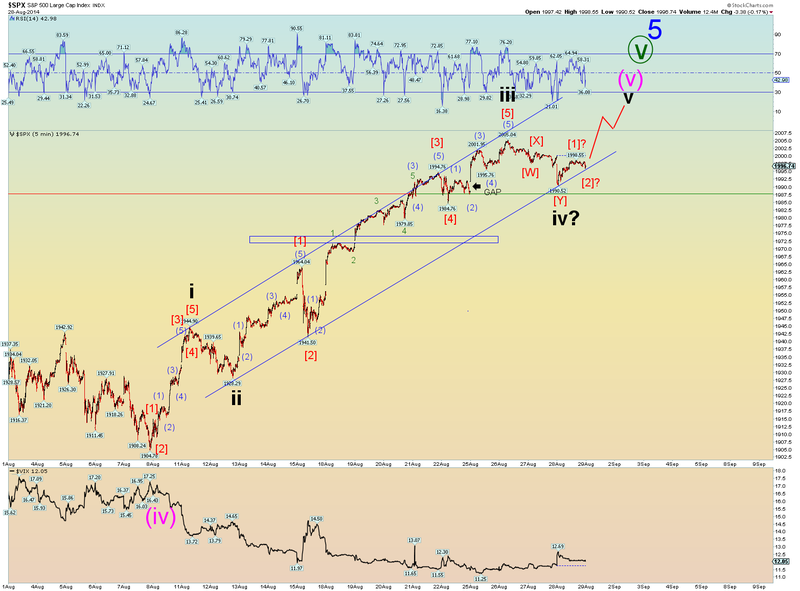 Best count for 30 year prices is a wave (2) up due to the size of the retrace and the sentiment extreme. 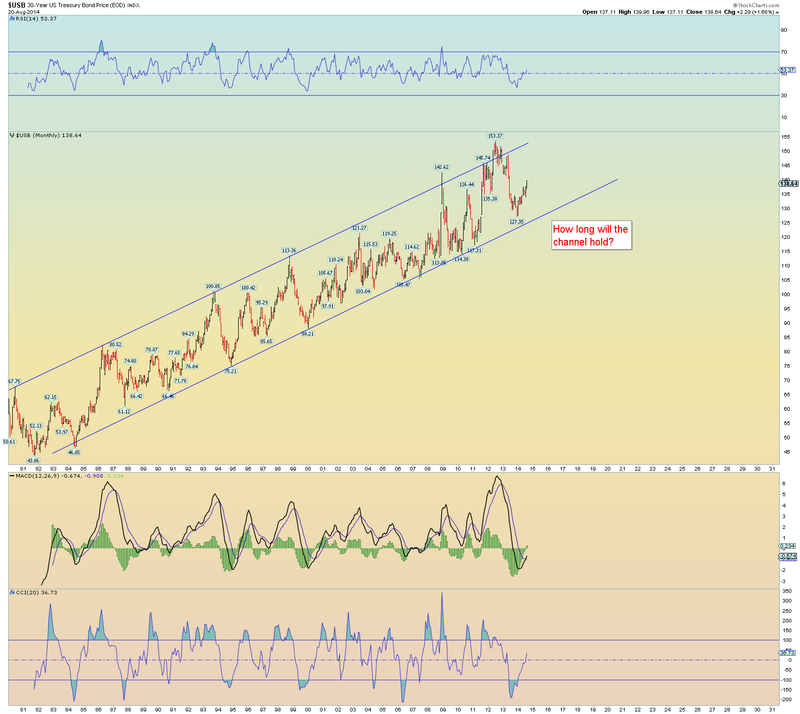 Long term bond channel will someday break down decisively. We know we must be near the end because the rates have reached extremes in the past few years. You can't get much lower than 0%. Well, actually you can go negative (Germany at the moment?) but that's a definition of extreme is it not? Yield chart of the 6 month. Bull flag? A break over resistance would be an interesting development. And yes, the massive debt burden of the country and corporations would suffer heavily under a rise in interest rates. And they will rise. These charts are hard to count, but they might be working themselves into position to also sell off. And what would that do to major commodity exporting countries? Elliott Wave International likes to call it "all the same markets" where as social mood turns and everything sells (at least in the strongest portions - wave threes - down). 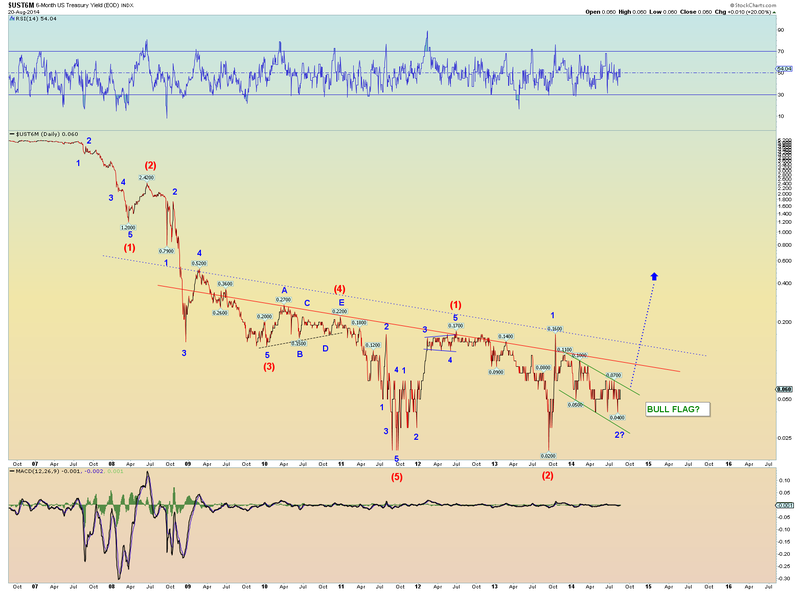 Stocks, bonds, commodities, gold, etc. Well what asset class would likely be the winner? King Dollar of course. Selling all that crap (and the resulting bankruptcies) create a demand for hard cash. 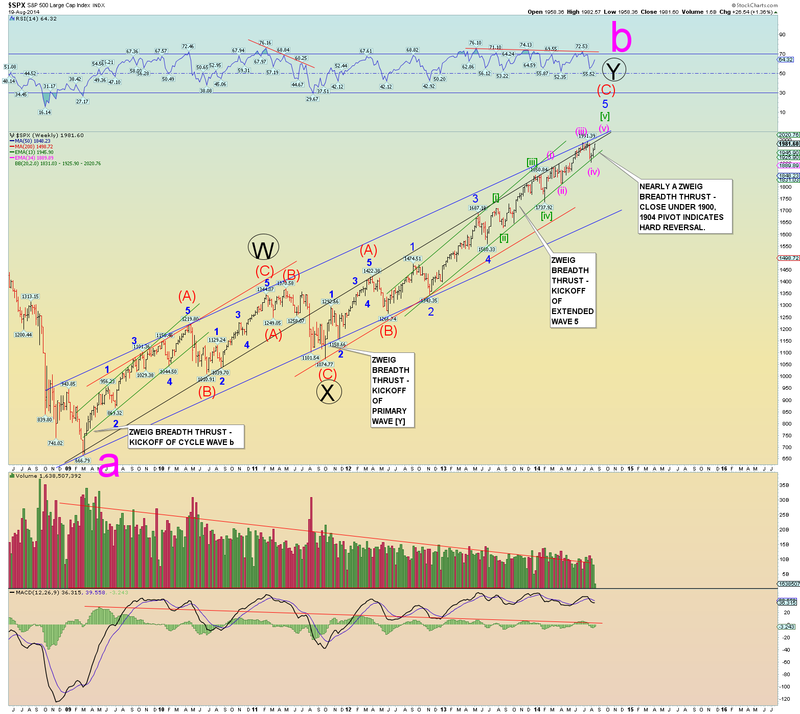 This chart has been in a long term exhaustion period in my opinion. 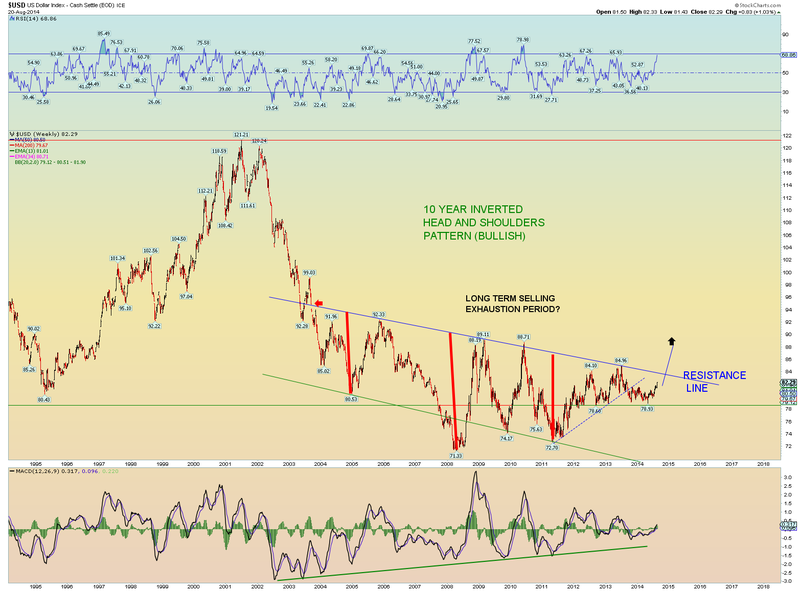 Like the 6 month bond yield chart above, a break over resistance would be an interesting development. 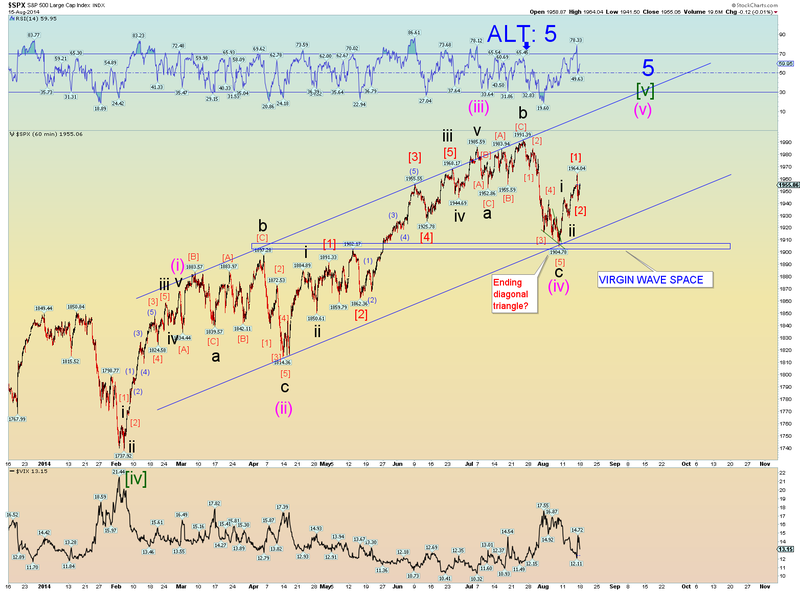 Its been a long haul tracking this structure for the last 26 months or so, but Intermediate wave (C) of Primary wave [Y] is in a wave count position to come to an end. 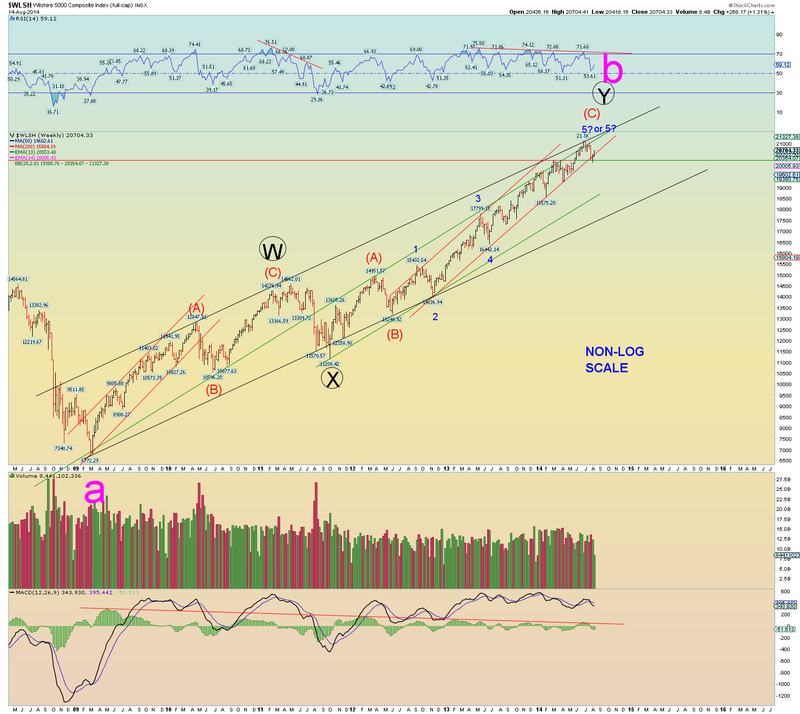 And after that, due to the Minor extended 5 at the end of the structure, we project stock prices to collapse to beneath 1560 of the SPX for an intial "kickoff" wave for cycle wave c which is projected to be a 5 primary-sized impulse down to finish out Supercycle wave (a). It should be quite a ride. 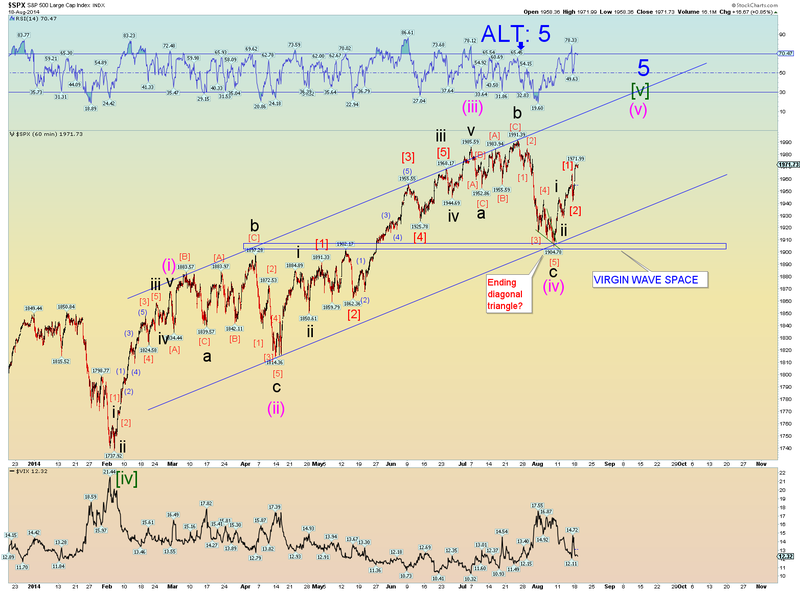 The alternate is that yes, a major high is coming but the ensuing selloff will be merely some long-winded major-type wave four from the 2009 low and then some major-type wave five would follow. 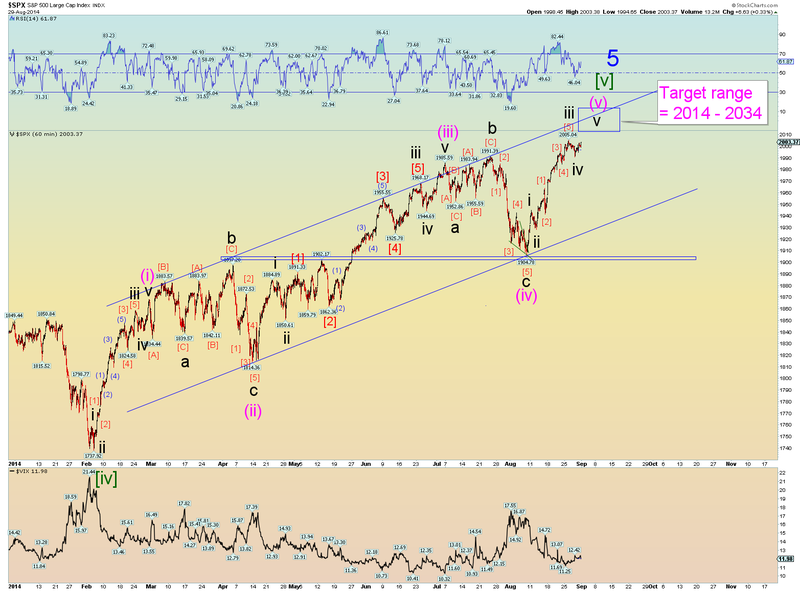 That kind of alternate long term count in place of cycle wave b suggests that the markets final high will likely be a year or more in the future because it will need time to play out the final waves of that size. But we won't worry about the long term alternate count for now. Lets wait and see what happens in the meantime. 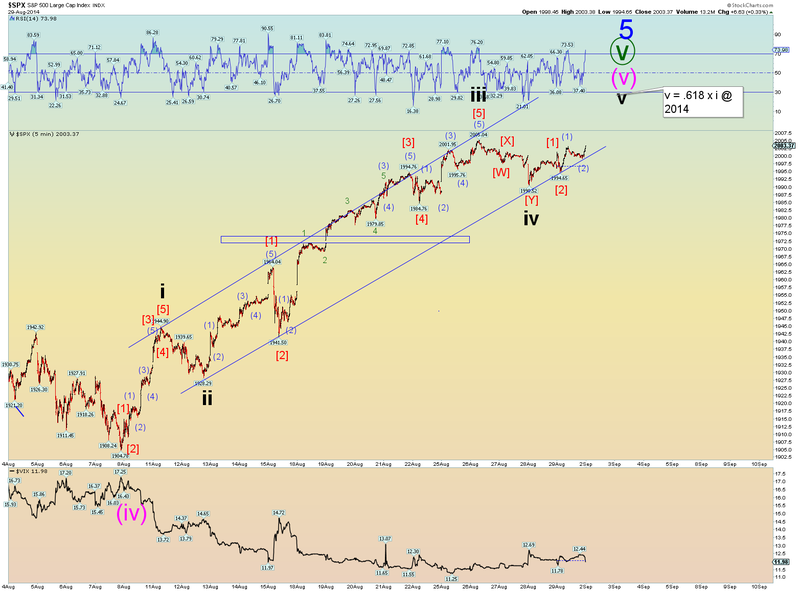 The market continues to unfold Minute wave [v] of Minor 5 up. The top of this wave is projected to be the top of cycle wave b based on the overall count since 2009. Today nearly triggered the fourth "Zweig Breadth Thrust" event since the 2009 low. A ZBT event is explained here. 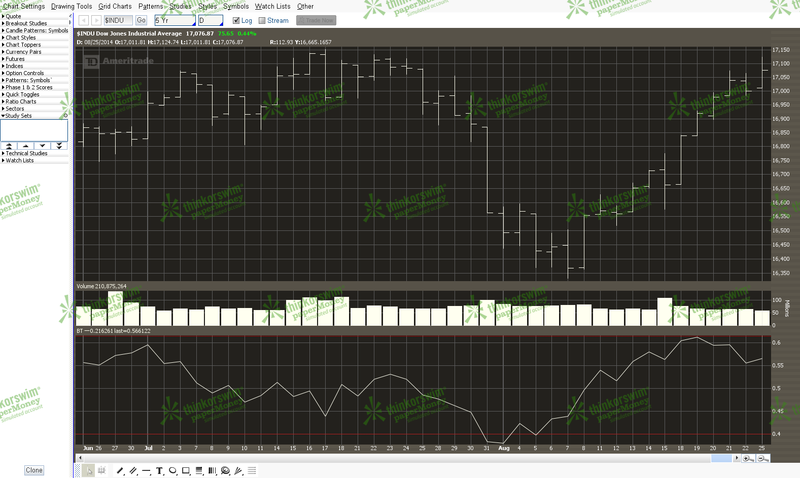 Basically in the chart below, the indicator on the bottom has to move from under .40 to above .615 within 10 days. Today was the 10th day and the data says the day ended at .611. So yes technically its not a ZBT event yet it still indicates a strong market move that suggests - perhaps - longer term strength than most bears would care to see. However the current primary wave count suggests it will not last as long as the 3 actual ZBT events. Location of other ZBT evenets in the wave structure shown below. No ZBT event has ever been closed under since the 2009 low. Even though the strong upward breadth of the past 10 days is not techncially a ZBT event, I would consider a close under 1900 SPX a reversal of the breadth move. Obviously I'm getting ahead of myself, but 1900 is an important level for future reference. Today's midday dip closed two open up gaps. Very convenient. The wave structure has reached a point where if it is  of iii of (v) of [v], then a strong upward push should occur in this area. Its getting interesting. The best bearish count has prices collapsing downward in a third wave down and breaking the parallel uptrend lower channel line. The overall count, once again, calls for a nominal new high in the SPX and probably the Wilshire5000. 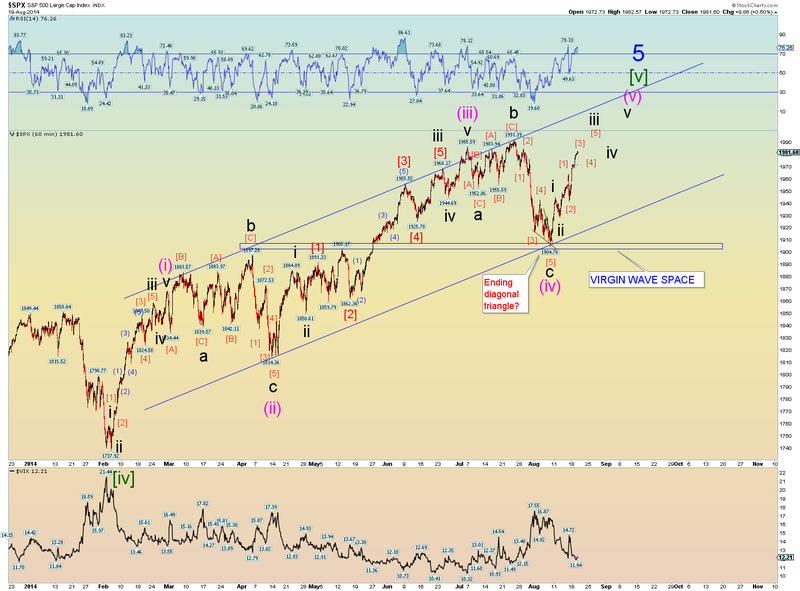 The theme is the SPX will make new all time highs in a final wave [v] of 5. Not sure about any other indexes as their charts were a bit damaged for the count by the latest decline. Monitoring a potential "Zweig Breadth Thrust" event. Wilshire count is damaged. Wave (iv) of [v] overlaps wave (i) of [v], a rule violation. Primary count is still valid. Minuette wave (iv) of [v] of 5 is still on the table. Virgin space was violated but was not completely closed. Possible ending diagonal triangle at yesterday's low explains today's surge reaction in an upward manner.